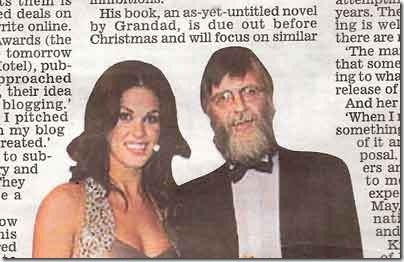 A photograph purporting to be me appeared in today’s Irish Daily Mail. I wish to state clearly and categorically, that Glenda Gilson and I are not an item. We only met the once and I spoke to her briefly a couple of other times. The fact that she has been spotted leaving here on many occasions in the early hours of the morning is a figment of the imagination. I would please ask my neighbours to stop phoning the papers about it. On a more positive note, the article is entitled “Misfits no longer, Irish bloggers are snapping up book deals“. That’s good. I’m no longer a misfit. It’s official. Thank you Sinéad. If you do happen to see the article, concentrate on the photograph of Feebee. She’s much nicer looking than me. Well, a little bit. And before anyone says anything, we’re not an item either. I would like to read the whole article before I comment. Don’t make me Google ™ for it. Glenda’s beard is very impressive. Any chance of a full scan? Ah,Jayzus lads! It’s feckin’ huge [and I’m referring to the newspaper article here]. It’s nearly a full page. Twenty – Won’t they have a spare one in Ron’s? Or do they only get the racing pages and throw away the rest? I’m sure I don’t have to tell you that a kindly sub-editor used the word ‘misfit’. Sinéad – Thanks for a good one! I am also extremely flattered to be called an oddity. You can be modest about the ‘misfit’, but I know the ‘oddity’ is yours. They deep etched your ears . . no wonder you’re deaf! I Googled it and can’t find it under “Irish Daily Mail” or “Associated Newspapers”. Are you sure it’s a real newspaper? Baino – They didn’t touch my ears. Who do you think I am? Dumbo? Wow -lookin’ good! I’d heard rumour about you and the big G, but I’m the soul of discretion, moi.